OK, fine, so that didn’t happen. (I mean, I didn’t get thrown out of Carmax. The part about Mercedes-Benz service is totally true.) What really happened is that one year ago, I went to my local Carmax and bought a used Range Rover, which is often considered to be the single least reliable vehicle ever produced in the entire history of mankind. Seriously: according to the latest JD Power surveys, you’ll probably get more trouble-free miles out of a wheeled office chair than a used Range Rover. I should note at this point that I know exactly what you’re thinking. 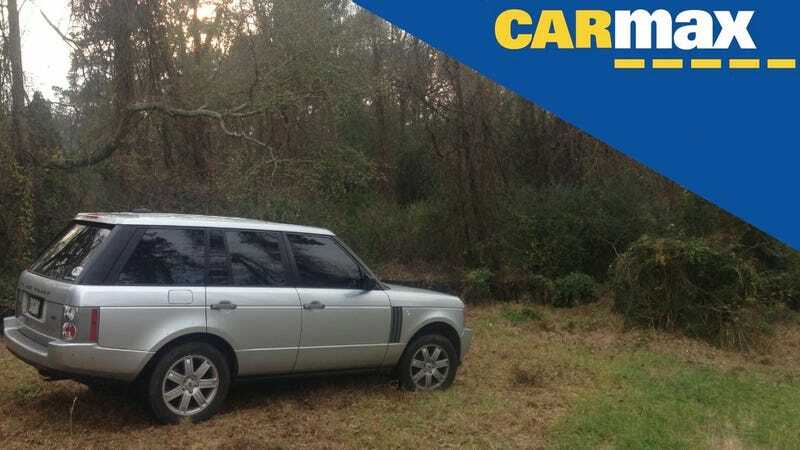 You’re thinking: If the Range Rover is so damn unreliable, why the hell did you buy it?! Are you stupid, or something? To which I would reply that you must’ve missed the part above where I said I once went to the Mercedes-Benz dealer… for service. Obviously I have a few screws loose. (Regular readers can verify this.) And I wanted a damn Range Rover. So I went to Carmax and bought one with … (DUN DUN DUNNNNN…) … an extended warranty. Now, I should say that I was initially a little cautious about this. That’s because I typically think of an automotive “extended warranty” as the kind of thing where you’re driving down the street and all four wheels come off simultaneously, and the warranty company denies your claim because you’re past due for an oil change. But the Carmax warranty was pretty well reviewed online – and most importantly, they gave me six years of bumper-to-bumper coverage for a little over three grand. This, mind you, on a vehicle where replacing a burnt-out dome light costs as much as a DVD player. If this is all starting to sound a little familiar, there’s a reason for that: I already told you about it. Way back in July, I wrote a column entitled Why Your Next Unreliable Luxury Car Should Come From Carmax, and the response was huge. I’ve written columns with more hits, and I’ve written columns with more comments, but I’ve never written a column that seemed to resonate with so many car shoppers eager to find a way to own a used luxury car without resorting to crazy tactics, such as dealing drugs, or going to law school. So it’s been a year. And since you all still seem to be so interested, I’ve decided to provide a little update on just how it’s been to have a Carmax warranty on one of today’s most unreliable used cars. My first dealer visit came in February, just two months after I bought the Range Rover, when I decided to get an oil change and a full inspection. I want to say up front that this isn’t because I don’t trust the Carmax inspection, which they claim covers something like 947 points and involves the mechanic doing things like thoroughly examining every square inch of the tires for rubberyness. It’s merely because I sometimes wonder if a mechanic who works on a Toyota Matrix, and then an Acura RL, and then a BMW 528i, and then drives home in his Nissan 240SX with neon green lights and cut suspension is really capable of noticing the peccadilloes of an aging British luxury car manufactured by people who weren’t entirely sure what they were doing until about half way through the second model year. And indeed, I wondered correctly. The Land Rover dealer – who, by the way, does a great job of notifying me whenever there are expensive repairs to be done – quickly discovered that the car had a burnt-out side marker bulb, a leaking radiator, and worn lower control arm bushings. The total cost for all this work was $1,748.50, though I paid for only the oil change, the marker bulb, and my $50 warranty deductible. Carmax covered the rest without flinching. Six months later, I was back in the shop for two reasons. One was to get another oil change. The other was to have the dealer find even more problems we could bill to Carmax. No, that’s not true! I’m just kidding! Please don’t void my warranty! I was actually back there to do something about the driver’s side taillight, which had about two inches of standing water sloshing around every time I turned the corner. Seriously: you could’ve gone to a strip mall pet store, bought a little goldfish, and given him a long, prosperous life entirely within the confines of that taillight assembly. And you could’ve fed him through whichever hole was leaking all the water. Although I told my service writer that I was more than happy to replace the taillight (at my cost, since Carmax doesn’t cover light assemblies or bulbs), he instead had an alternative suggestion, which involved drilling a hole through the assembly to let out the water. He neglected to mention that they had to remove the taillight to drill this hole, and that this was a surprisingly time consuming job that would be billed at the same hourly rate as the operating budget for the United States Marine Corps. In other words: yes, I am ashamed to admit I paid $53.66 for a man to drill a hole in my car. But I didn’t see any of you rushing over here with a drill. My last dealer visit came two months later, when I returned from a trip to discover that the mechanism which electronically tilts and telescopes the steering wheel had failed, presumably under the typical hard use that comes from a) sitting at the airport parking lot and b) doing nothing. Normally this wouldn’t be a problem, except that the steering wheel responded to this failure by going into the lowest possible position, which I believe is technically called: “If you get into an accident, the airbag will punch you in the groin.” The problem was traced to a seat memory module, which Carmax once again replaced without issue. So the first year is up, and I’m definitely looking forward to the second. That’s mostly because I’ve already earned back half my warranty cost, and I’m not even 20 percent done with the warranty. Of course, Carmax is rooting for the car to be a little more reliable this year, while I’m rooting for the exact opposite. I want things to break. I want to get my money back. I want to beat the system. And unfortunately for Carmax, I think I’ll win. After all, it is a Land Rover.